Do you have great hunting skills? Are you a quiet, emotionally detached, yet opinionated soul? Perhaps you have dreams of escaping your current lifestyle and taking up with strangers from strange lands? If this sounds like you, then we may just have the opportunity you’ve been looking for: professional huntress! Whether you fancy yourself an adventurer or wanderer, being a huntress is an excellent career path for the right type of person. You get to wander unexplored lands and fight dictatorships on the regular, and as an added bonus, you can become a rock star in your own right – the woman everyone looks to for hope and inspiration. Sounds like a pretty good gig from where I sit! If you want to be a huntress, then you have to dress the part. 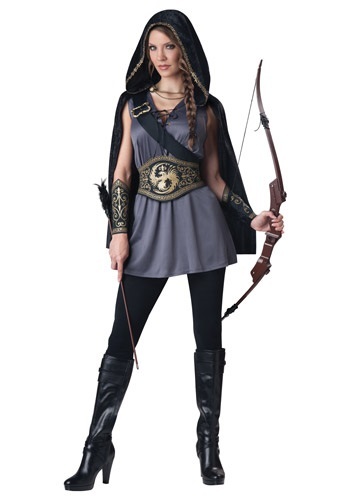 This women’s huntress Halloween costume has everything you need to take on the world, one crooked politician and overzealous overachiever at a time. The gray tunic has a laced front placket with an elastic waist for a flattering fit. The faux suede shoulder sash is sewn to the right shoulder and left hip so you don’t have to worry about losing it in your next adventure. The matching belt has a printed gold eagle and filigree design and fastens with fabric ties for a comfortable fit. To stay undetected at night, the costume comes with a hip-length crushed velvet cape that has a chain fastener at the neck. Finally, the faux suede gauntlets have a matching gold design to top off the look. Add pair of black leggings and a bow and arrow to take your look from amateur to professional! I received the costume incomplete missing parts and in a size too small as I followed the size chart on the website. The size chart on the costume package was different. Customer service was really great - they sent out a replacement costume in a larger size with no cost and it arrived in 2 days. It fits perfectly and I love it.